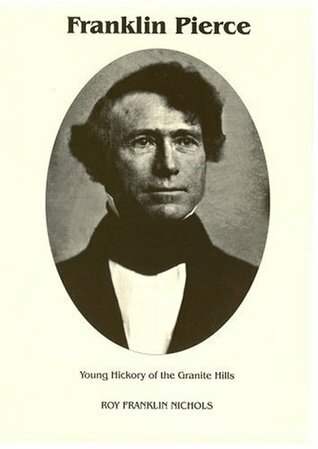 “Franklin Pierce: Young Hickory of the Granite Hills” is Roy Nichols’s 1931 biography of the fourteenth U.S. president. Nichols was a historian, a longtime professor at the University of Pennsylvania and a Pulitzer Prize winning author. He was particularly well known for his analysis of nineteenth-century American political history. Nichols died in 1973. Until recently, Nichols’s biography of Franklin Pierce was the only complete, full-scale work available on this former president. That changed about ten years ago with the publication of Peter Wallner’s two-volume biography (which I’m reading next). But with seventy-six chapters and nearly fifty pages of notes and bibliography it is hard to imagine anything incomplete about Nichols’s work. Due to the expense involved in obtaining this text – and to the obscurity of Pierce himself – this biography is seldom read anymore, and even less-often reviewed. Nonetheless this longstanding classic receives high marks for its magisterial examination of Pierce’s complex and misfortune-filled life. A critical element in diagnosing this former president’s failings involves understanding his background, personality and private life. Fortunately Nichols is up to this task and these factors are intricately woven into the discussion of Pierce’s political career. By the time I completed this biography I was more familiar with the personality and psychological profile of Franklin Pierce than with any former president since Andrew Jackson. More broadly, Nichols’s biography is exceedingly comprehensive, exceptionally scholarly and meticulously detailed. Much of the book, in fact, reads as though the author was a historian resident on Capitol Hill during Pierce’s many years in Washington as a member of the House, the Senate and as President of the United States. The highlight of this biography, however, is its final chapter which was written for the book’s second printing about fifty years ago. Here Nichols provides a lengthy, insightful and balanced examination of Pierce’s life and legacy. He dissects the issues and circumstances that affected (and afflicted) Pierce with remarkable dexterity. Unfortunately for the unsuspecting reader, the level of detail Nichols provides in this biography is overwhelming at times. Only a true scholar (or extremely zealous fan) of Pierce will fully appreciate the astonishing mass of facts presented. That reader will probably find this book a treasure trove of interesting nuggets. A more casual student of history, however, is likely to find the detail excessive, dull and frequently tangential. Fortunately, between the significant sections of impressive but seemingly unimportant details are periodic bursts of exceptional wisdom and brilliant insight. Those moments make this book occasionally magnificent. Of less importance, the author’s writing style is obviously dated, though not quite ancient. The text itself flows smoothly and is easy to read but requires intensity of focus to consistently understand. Numerous sections of the book require two passes for full comprehension – something only an extremely faithful reader will tolerate. Paragraphs, it may be noted, routinely approach a full page in length. Overall, however, Nichols’s biography of Franklin Pierce deserves excellent marks for its scholarly, comprehensive and sober analysis of Pierce and his presidency. For an academic audience, these qualities may define the nearly perfect examination of Pierce. But for most readers, the book’s density, dated style of writing and occasionally superfluous observations make this an informative but plodding, rather than exciting, biography. It is too easy for teachers to gloss over Pierce as a stooge to the slave owning block….but the inclusion of Southerners in his Cabinet was essential peace keeping. Just joining in here. I started this same project in July 2013. Trying to keep a president a month pace. I’m on Van Buren, which drove me to the internet to find a decent biography (currently reading Widmer). I am excited to find someone blazing a trail before me that I can follow your path. I have read some of the same authors you chose and look forward to reading your earlier posts. I hope I can catch up at some point and can join in the current conversation. Off to find a copy of Cole’s biography of MVB.